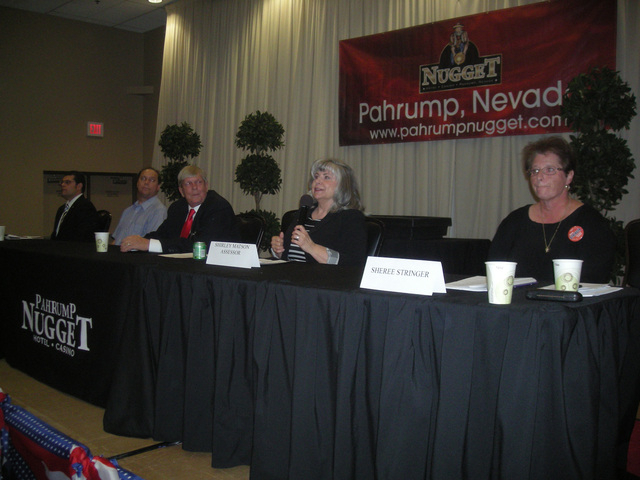 Nye County Assessor Shirley Matson said she never stole any mail in response to a question about an FBI investigation, during a candidates forum at the Pahrump Nugget Hotel and Casino Thursday night. Four assessor candidates took the stage on the last of three candidate nights moderated by KNYE-FM radio owner Karen Jackson. Candidates fielded some hard-ball questions furnished by the general public. Last October, FBI agents raided Matson’s office and seized two county-owned computers over allegations of possible tampering with a piece of mail from the Nye County human resources office to the FBI’s Las Vegas field office. The package included a computer disc. A county employee reported Matson retrieved the disc from the outgoing mail, had it for several hours, then dropped it off at the post office after the county mail was picked up. “Our HR manager did not send a letter to the FBI in the proper manner. I took the envelope and put it in the mail. Now I’m in control of that office so I have to sort of oversee what’s going on. So there was no mail stolen and unfortunately I have a couple of delusional employees that were in the office who came up with this crazy idea. I’m still kind of angry about it where they did this phony FBI sting,” Matson said. Her challenger, personal property appraiser Sheree Stringer, an employee of the assessor’s office the last 10 years, defended herself and another employee against Matson’s accusations they notified the press to do some character assassination of her. “We never had an issue like this before. We did witness her take the envelope out of the mail, didn’t know who it was addressed to, just made a phone call and asked the last two people that were there doing their mail if they put something in the mail slot or in the mail box that sits on her counter and found out it was something from HR. That’s all we did. Where it went from there, it escalated from there. We didn’t make a phone call to the FBI,” Stringer said. Candidate Richard Marshall, who retired to Pahrump nine years ago after 31 years with the Virginia Beach, Va., assessor’s office, said the mail drop has since been moved from the assessor’s office. Candidates were asked what they would do during their first 120 days in office. “We had some problems. I served on the Board of Equalization and I’ve seen some problems that have come to the board’s attention. I definitely want to review some procedures that are taking place in the assessor’s office,” Marshall said. Matson replied there were only three appeals before the Board of Equalization this year. “I want to continue looking at some of the disparities with some of the values when we have some people who have friends, family and so forth doing appraisals for themselves as well as other members of the community,” Matson said. She said she’s been doing the work of a chief deputy as well as herself. “We need to repair the emotional aspect in the office. The ladies in the office need to know that the drama is over. I want to focus on working with the employees, relieving some distress since 2010 when the buyout happened, we have not been able to get the employees that we lost. So we’re working extremely short-handed, people are working out of their job classification because of statutory obligations in order to get the job done,” Stringer said. Leonardo Blundo, owner of Carmelo’s Restaurant, said he’s going to closely watch procedures if he takes office. “I was brought up in this county. I’m used to a small, rural-type environment. It will be my passion to get all the properties on the roll because that will benefit all the citizens of the county. I can’t guarantee a lower tax rate but that’s how the tax rate is figured out, the higher assessed value you have the potential to lower the tax will be. I have a passion for this. I only did it for two years but I loved the people I worked with. I work well with figures,” said Nick Bradshaw IV, who worked under former assessor Bernie Merlino in 1989-90. Marshall said at the last Board of Equalization meeting a property showed up that the assessor was trying to get on the tax roll that had been missed for years. For another property there wasn’t any relevant properties on the map for a comparison, situations he wants to clean up. Matson said the property in question was a mine that had been off the tax rolls since 2002 that was picked up by the new aerial pictometry program she instigated. Marshall said a Realtor commented the assessor’s office was six months behind updating the deeds. Matson disagreed, saying most of the staff are current in their work, though she criticized her employees. “One of the problems we have at the Nye County assessor’s office, I don’t have a lot of people that are really that concerned about the everyday person out there, they’re more concerned about how many days they can take off. Some days I feel like a social director,” Matson said. Blundo said government needs to remember they’re a business. He offered to attend county commission meetings and citizen gatherings. “We need to increase productivity in this office because it is in direct correlation with the county budget. Those are the problem-solving skills, looking outside the box, being a private entrepreneur versus a public employee. Government is a business. I am a business veteran. I succeeded with my business and I would like to succeed for the county,” Blundo said.